At its completion in 1972, the 100-meter diameter Effelsberg radio telescope was the world's largest fully steerable telescope. It remained so for 30 years. 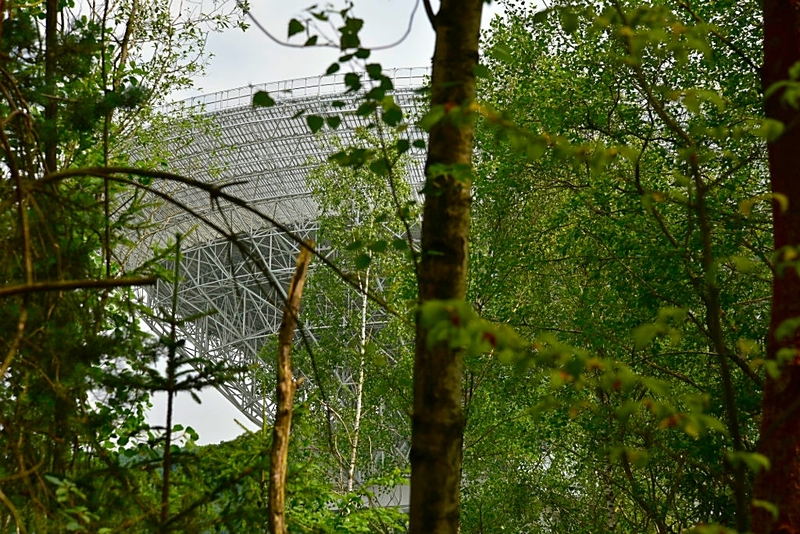 Operated by the Max Planck Institute for Radio Astronomy in Bonn, the Effelsberg 100-m Radio Telescope is the second largest steerable single-dish radio telescope in the world. It is located near Bad Münstereifel in North Rhine-Westphalia. 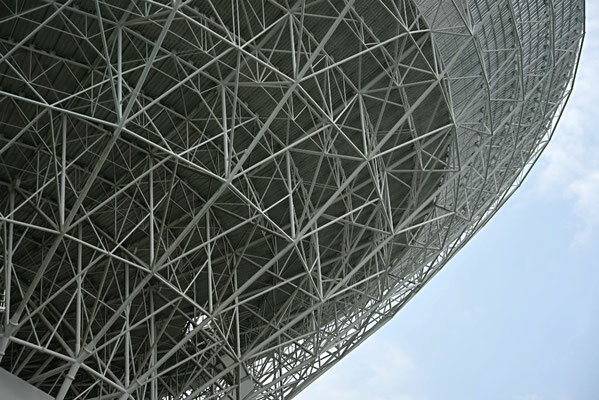 Inaugurated in 1972, it was the largest steerable dish in the world until the collapsed Green Bank Telescope in West Virginia was rebuilt in 2002 with a 100 x 110 meter dish. 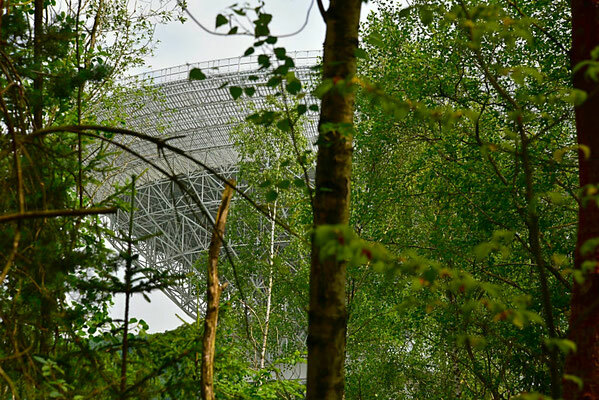 Effelsberg and Green Bank, however, still have the same resolution at a given wavelength because both telescopes have a 100 meter diameter circular aperture. Effelsberg has a symmetrical* Gregorian** configuration. The primary reflector is a paraboloid with a focal length of 30 m. The secondary reflector is concave ellipsoidal, with a diameter of 6.5 meters. It is located 32 meters from the primary reflector, two meters behind (towards the sky) primary focus. 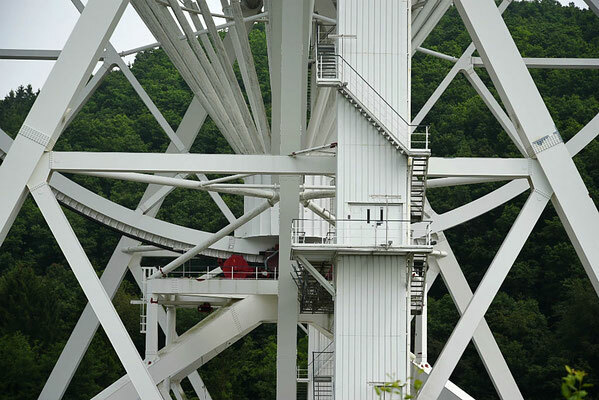 Through nine different receivers at both the primary and secondary focus, the telescope detects radio emissions ranging from 90 cm (300 MHz) to 3.5 mm (90 GHz). 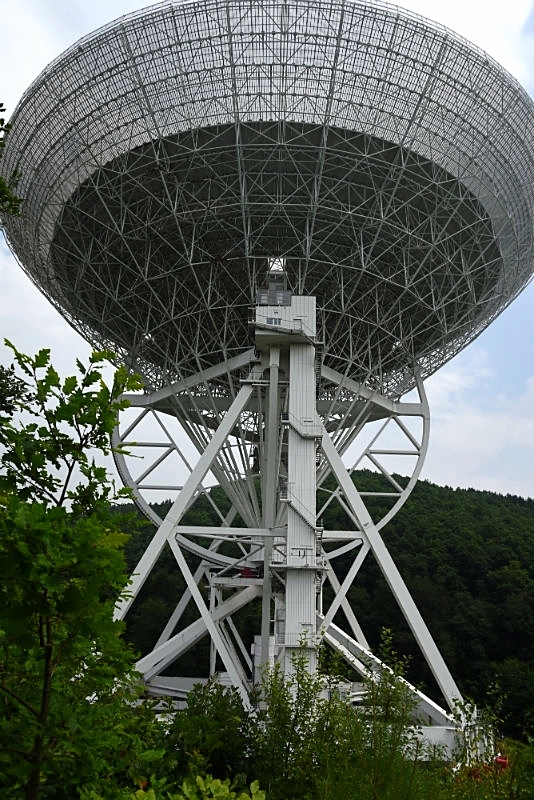 * The slightly larger Green Bank radio telescope has a non-symmetrical (off-axis) configuration. This increases its reflecting area by elliminating the shadow of the secondary supports and housing. **The concavity of the secondary mirror (or radio reflector) defines if a telescope is Gregorian or a Cassegrain. In both types, the two foci of the secondary's conic are located at the primary mirror's prime focus and behind the primary at the secondary focus. The classical Cassegrain has a convex hyperboloid secondary inside prime focus, whereas the Gregorian has a convex ellipsoidal secondary outside prime focus.